Apple today made several commitments to environmental conservation efforts based on recycling old iPhones. To start, the company will make a donation to Conservation International for every device recycled at Apple stores and Apple.com between now and April 30. Eligible devices will receive credit that customers can use toward an in-store purchase or put on an Apple Store Gift Card. The value will vary by device. Conservation International protects natural resources. 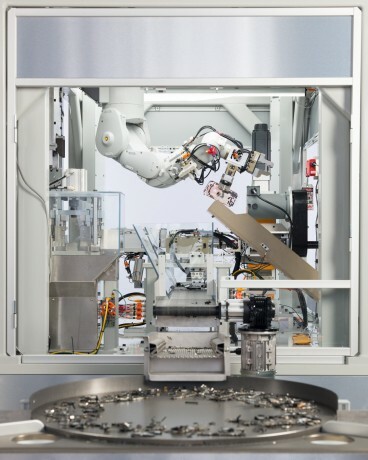 Further, Apple debuted Daisy, a new robot that disassembles old iPhones in order to recover valuable materials for recycling purposes. Apple says Daisy can take apart nine different iPhone models, and disassemble up to 200 devices per hour, removing and sorting components. "At Apple, we’re constantly working toward smart solutions to address climate change and conserve our planet’s precious resources,” said Lisa Jackson, Apple’s VP of Environment, Policy and Social Initiatives. “In recognition of Earth Day, we are making it as simple as possible for our customers to recycle devices and do something good for the planet through Apple GiveBack. We’re also thrilled to introduce Daisy to the world, as she represents what’s possible when innovation and conservation meet." Apple continues to work to reduce its carbon footprint, use safer materials in its products, and power its facilities with clean energy. Last, Apple said it will send an alert to Apple Watch users on April 21 challenging them to go outside and complete 30 minutes of activity. Those who do will be rewarded with unique stickers in iMessage. Do you ever wish your iPhone had a notification light? Do you use the LED flash to notify you of incoming calls, but wish it weren't blindingly bright? Is photography your passion? If so, and you're in the market for a new phone, the Apple iPhone X, Google Pixel 2 XL, and Samsung Galaxy S9+ should be at the top of your list. The last twelve months have given us some of the most compelling smartphones ever made. New screen shapes, advanced cameras, and waterproof bodies have improved the everyday experience of those willing to fork over lots of cash for high-end handsets. Lifeproof's Slam case for the iPhone X is a two-piece model that provides drop protection from as high as two meters. It adds a splash of color to your phone in addition to peace of mind. Smartphones are better than ever at capturing high-quality audio, but nothing beats a dedicated microphone. The Mikme microphone should appeal to videographers, vloggers, musicians, podcasters, and others who want to record the best-possible audio on their iPhone.